Register the component for the current user (Recommended for non-admin users) —This option enables registering the component for the current user account. It is provided for users without admin rights. 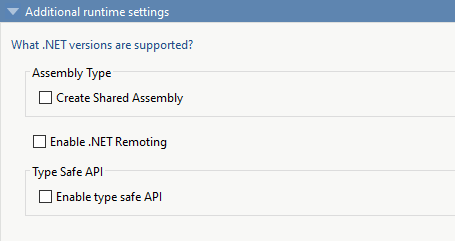 Create Shared Assembly — Enables sharing MATLAB Runtime installer instances for multiple .NET assemblies. Enable .NET Remoting — Enables you to remotely access MATLAB functionality, as a part of a distributed system. For more information, see Create a Remotable .NET Assembly. Enable Type Safe API — Enables the type safe API for the packaged .NET assembly. Create all interfaces — Create interfaces for shared libraries using both the mwArray API and the MATLAB Data API. Create interface that uses the mwArray API — Create an interface for a shared library using the mwArray API. The interface uses C-style functions to initialize the MATLAB Runtime, load the compiled MATLAB functions into the MATLAB Runtime, and manage data that is passed between the C++ code and the MATLAB Runtime. The interface supports only C++03 functionality. For an example, see Generate a C++ mwArray API Shared Library and Build a C++ Application. Create interface that uses the MATLAB Data API — Create an interface for a shared library using MATLAB Data API. It uses a generic interface that has modern C++ semantics. The interface supports C++11 functionality. For more information, see Generate a C++ MATLAB Data API Shared Library and Build a C++ Application.